Environment Minister Catherine McKenna says the report looks backwards. 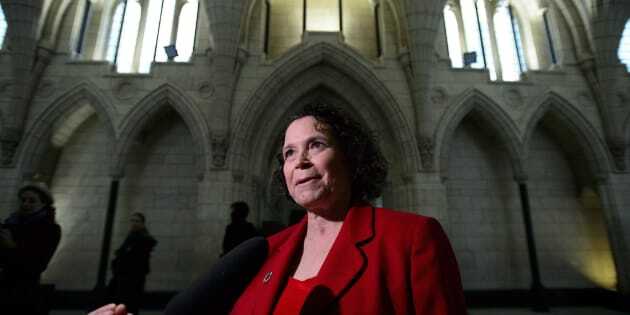 Julie Gelfand, commissioner of the Environment and Sustainable Development, arrives to appear as a witness at Commons committee in Ottawa on March 27, 2018. OTTAWA — Neither Ottawa nor the provinces have really assessed the risks a changing climate poses to the country and have no real idea what might be needed to adapt to it, said a new audit released Tuesday. The joint audit, conducted by federal environment commissioner Julie Gelfand and auditors general in nine provinces, looks at climate change planning and emissions reduction progress between November 2016 and March 2018. It says while many governments have high-level goals to cut emissions, few have detailed plans to actually reach those goals, such as timelines, funding or expected results from specific actions. The audit says assessments to adapt to the risks posed by climate change have been haphazard, inconsistent and lacking in detail, with no timeline for action and no funding. The country's emissions goals are also a hodgepodge of different targets, with no consistency in how emissions are measured or whether cuts will target overall greenhouse gas outputs or just those from specific economic sectors. The auditors say that means there is no clarity on how Canada and the provinces and territories are going to measure, monitor and report on their contributions to meeting Canada's international commitment to cut emissions by at least 30 per cent from 2005 levels by 2030. As of 2015, the most recent year for which full statistics are available, Canada was nearly 200 million tonnes short of that goal, which is the equivalent of the emissions produced by about 44 million cars each year. That is twice the number of vehicles registered in Canada. Environment Minister Catherine McKenna said it is the first time auditors have completed such a review of Canada's climate change policies which is an important recognition of the priority climate change should have in government business. But she says the audit, as Gelfand herself notes, looks backwards and does not actually take into account the Pan-Canadian Framework on Clean Growth and Climate Change. That plan was released in December 2016, after the audit's scope was already established. It too falls short of reaching the 2030 goals however. McKenna said the plan addresses many of the concerns in the audit, including outlining how certain policies will achieve specific emissions cuts. "The previous government did nothing for a decade but we're 100 per cent committed to our target," McKenna said. "Hard things are hard, we have a plan and we're already seeing measurable results." Environment and Climate Change Minister Catherine McKenna poses for a photo in her office on Parliament Hill on Nov. 7, 2017. Catherine Abreu, executive director of the Climate Action Network, said this audit looks at what progress was made to meet Canada's existing targets including the 2020 commitment, which Canada has abandoned knowing it has no hope of meeting it. That target was to be 17 per cent below 2005 levels by 2020. Abreu notes that is the third international emissions target Canada has set and will miss and the Gelfand report points out the 2030 plan is at risk if Canada and the provinces don't step it up. All provinces but Saskatchewan are currently signed on to the pan-Canadian framework, which requires every province to put a price on pollution by the start of next year. The four biggest provinces already have one, Manitoba will add a $25-a-tonne carbon tax in September and every other province will either have to establish their own price or have a federal price imposed as of next Jan. 1. There are potentially rough waters ahead. Saskatchewan hasn't joined the framework and says it will sue if the federal government tries to impose a carbon price. Ontario and Alberta both have a carbon price plan in place — cap and trade for Ontario and a carbon tax system with hard caps on emissions from the oil sands for Alberta — but coming provincial elections could bring to power premiers who are running on a promise to end carbon pricing. McKenna said not only is the clean technology industry developing in response to climate change an enormous economic opportunity, not taking climate change action will cost the government money. "It is disappointing when you have politicians pretending that there is no cost to climate change," she said. "Right now the cost to the federal government is in the billions of dollars to deal with the impacts of climate change, whether it's floods, whether it's forest fires, a melting Arctic, we need to be taking action."